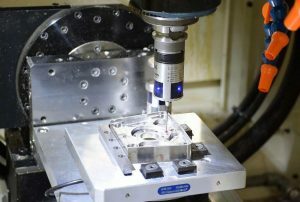 SCHAUMBURG, IL (September 2017) – FANUC America has selected HEIDENHAIN’s touch probes for use and training on its popular ROBODRILLs in its recently expanded CNC machining laboratory in Hoffman Estates, IL. There, FANUC America offers 16 different classroom courses teaching end users about maintenance, operations and programming. HEIDENHAIN’s touch probes will be used for hands-on exercises in the FANUC machining labs. HEIDENHAIN probes are well known for their optical trigger mechanism that prevent wear on probes and components therefore guaranteeing accuracy for long periods of time. At FANUC’s machining laboratory, students will have the opportunity to become familiar with these probes and the use of advanced automated probing along with the basics of machining. HEIDENHAIN’s TS 460 and TT460, workpiece and tool probe respectively, are triggering touch probes that offer either radio or infrared signals. The TS 460 model also has a patented collision adapter that protects both the probe and machine tool spindle in case of a collision. Now in place at FANUC America, these probes are providing assistance with machine tool setup, measuring and monitoring functions in order to improve dimensional accuracy of finished workpieces. HEIDENHAIN offers advanced application support for the touch probes. For more information, contact HEIDENHAIN’s Product Specialist Julian Renz at 847-884-4761 or write to us at HEIDENHAIN CORPORATION, 333 E. State Parkway, Schaumburg, IL 60173. FANUC America Corporation is a subsidiary of FANUC CORPORATION in Japan, and provides industry-leading robotics, CNC systems, and factory automation. FANUC Corporation is the worldwide leading manufacturer in factory automation for CNC systems, robots and production machinery (ROBODRILL, ROBOCUT and ROBOSHOT). Since 1956, FANUC has been a pioneer in the development of computer numerical control equipment in the automation industry. HEIDENHAIN CORPORATION is the North American subsidiary of DR. JOHANNES HEIDENHAIN GmbH, a leading international manufacturer of precision measurement and control equipment based in Traunreut, Germany. The product line includes linear scales, rotary and angular encoders, digital readouts, digital length gauges, CNC controls, and machine inspection equipment.